was receptive to having her engineers analyze Marc’s concept and for a later meeting with them to enable us to go into the technical aspects of the alternative proposal — what we call the Parallel Highway vs. DOT’s Promenade Highway. We anticipate that that meeting will occur once DOT has done a preliminary analysis. According to the Eagle story, local elected officials, including State Senator Brian Kavanagh, Assembly Member Jo Anne Simon, City Council Member Stephen Levin, and Borough President Eric Adams have shown interest in this matter. I posted the entire text of the BHA’s statement on Wednesday’s Open Thread. As I commented on the Eagle, let’s see: do we want to adversely affect many small and large buildings that back onto the Promenade and their perhaps thousands of residents—not to mention thousands of tourists and many local businesses—or do we want to temporarily impact the dirt berms along the eastern edge of Brooklyn Bridge Park? To my mind, this is a no-brainer. Your “dirt berms” include several residential buildings in the vicinity, housing nearly 1,000 Brooklynites. But I guess since they are part of the “horrible park” that ruined your views and attracts a “basketball nuisance” it’s totally cool. Park is park. This certainly shows promise, and is far better than the “innovative” proposal. Do they say how many lanes wide the double-decker structure will be? I assume 3 lanes on each level. I do like that they plan for “traffic management techniques” too. This ought to be an opportunity to introduce bridge tolls or other strategies to try and discourage our city’s reliance on automobiles. Usually when someone says something is a “no-brainer” it only means they haven really thought it through or don’t thoroughly understand the problem. I said the berms, not 360 Furman Street or the other residential buildings. Do not accuse me of something I did not say. But in this case, not so. Do not accuse me of thoughts or actions which I did not say, nor imply. And the word is “haven’t”, not “haven”. Well, people don’t know what they don’t know, I have educated myself on most aspects of the engineering involved, thought through possible “over the berms” or “through the park” scenarios. While technically possible to some degree, the enormous cost involved and limited benefit will likely make any such scheme a no go for the DOT. That’s what Archie does. He’s just “thinking outside the box” again. BUT the tradeoff is a much more complex & expensive proposal – PLUS the added height makes sound issues more pernicious. And last, it’s as if somebody important at the BHA had a temper tantrum a la 4-year-olds and POTUS. “Throw out the constraints that make for limited choices!” NICE! [ironic!!] Tell Cuomo and a Legislature feeling its way to drop dead or roll over! Yeah, that’s got excellent chances. Remember, the DOT takes orders from the Mayor, and HE belatedly recognizes that he’s almost as constrained in that role as he was as Public Advocate. Remember, too, that he talked about saving LICH … until crunch time. His current “I’m open to alternatives” is the kind of head fake that sometimes works on a basketball court – and might here, too, since the BHA has let the world see that it’s holding a trash hand and is low on chips. How does the BHA-proposed route negotiate these and other structures, and how does their route connect to the existing BQE? Just curious. The “berms” include a much needed children’s play ground which is slated to be completed in 2020, as well as the maintenance structures for the park. Additionally the “berms” are part of the park which create not only a noise and visual barrier between Furman traffic and the recreational areas but are essential parts of of the ecosystem which support the wildlife on Piers 1, 3 and 4. If you have spent any time walking IN the park, this is quite clear – especially near Piers 3 and 5. Don’t dump this on the park. Kill the “innovative” approach and take the pain of lane by lane. If you are asking me, I am neither an engineer nor an architect. I’m just a commenter here. Your answers lie elsewhere. Google “people don’t know what they don’t know,” but don’t ask me these questions. How about some details on your “no brainer” plan? I realize that Andrew, but my understanding is that you’re also following these proceedings more closely than I am, so I value any illumination you can provide. If you don’t know the answers to my questions that’s fine too, I don’t expect you to, I was just wondering. LOL, That’s exactly what I meant with my criticism of your “No brainer” comment. You blindly touted the “over the berms” plan without any sound reasoning to support it. “Lane by lane” is even less likely to happen than a tunnel – which means that they’re both in the <1% probability range. Compare "the waterfront" in neighboring Cobble Hill to "ours!" Thank heavens, Heightsers in Robert Moses' day did not simply roll over as BHB's most frequent poster advocates. He kvells about a proposed playground on the berm … and – what? – "overlooks" what will happen to Pierrepont Street's one. Let's keep our eye on the ball. An athlete who lets his attention wander to what car he'd like to buy … is likely to get a concussion. "Fix the BQE plan" is "MAGA" for thinking people – sounds good and IS good. Yes, the Heights would survive even 10 years of a highway where the promenade is now – the DOT is not THAT crazy – but it would give Robert Moses the last laugh and make life in the Heights enormously less high quality! "Going through the park" isn't NIMBY-ism – it's simply (and it's far from being a close call) the lesser of 2 evils. THESE ARE "the finalists." No sense whining that "Roger should have been out there on Sunday." 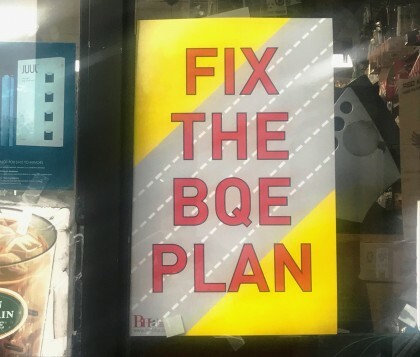 It's time to pivot from "Fix the BQE plan" to "Let us breathe!" That's what's at stake here – if the DOT plan happens, hundreds of Heights kids will go to school wearing face masks. Every person reading this blog can connect the dots between cars and climate change, so anything short of civil disobedience to Promenade-into-6-lanes is simply self-immolation. “The finalists”? No “through the park plan” is yet a contender. The BHA only spoke of an elevated temporary structure to the west (over the berms), no graphic representation showing it to be feasible has been presented. Honestly, I don’t hold much hope for it either. 1. it would be a monumental engineering challenge to get the highway around the obstructing buildings to the north and rebuild that section of the cantilever. 2. It would also significantly increase costs and time. 3. The gain would be minimal, except for those residents directly abutting the promenade, not that they don’t count but I don’t see the City of New York caring that much about them. Not sure why everyone thinks the Tunnel is so futile when Polly Trottenberg said at the presentation meeting, it was still on the table. Overall, the Tunnel is a much better solution, not only related to the reconstruction of the cantilever but to Brooklyn and NYC as a whole. Actually, what’s next – barring a kind of groundswell that goes way beyond some signs in Heights windows – commercial & residential – is an environmental impact statement. This is like WNYC’s hiring a law firm to “review its commitment to diversity.” You get what you pay for, and the DOT will certainly hire carefully and get a “not wonderful … but not health-threatening” verdict. I seriously doubt whether the engineering firms’ mandate will include any named or how-about-X alternatives. That’s why the BHA’s lethargy is so distressing. “You gotta reconsider your plan” (said to the DOT) is oh so easy to ignore. Last try … today. It’s NOT about Columbia Hts. residents – not only am I far from there, but I share your sense that they embolden Bill rather than worrying him. The Promenade IS even more a “Heights feature and amenity” than the High Line could ever be for Chelsea. If it had a usage pattern similar to Cadman’s Park, it would be “toast.” BUT IT is a top 3 NYC photo-op, and tourism is a top 3 economic driver for NYC. Manhattan rallied when Central Park was at risk; Brooklyn has got to rise to the occasion, too. “through the park route”. I’ll take that as you have no answers. Yes, near Atlantic WILL be challenging, but that’s why they’re talking $4 Billion and 8 years, both of which will probably balloon. But I’ve walked every inch of the route I propose, and I believe it’s viable. In due course, the BHA will produce (or reproduce) some drawings, and you’ll see that it actually will be much LESS challenging than the DOT proposal. Theirs, in fact, is like a dentist doing a root canal on a patient in the process of devouring a bowl full of corn on the cob. Here’s a famous old quote that’s applicable: Once you eliminate the impossible, whatever remains, no matter how improbable, must be the truth. That’s where we are – the DOT plan borders on impossible – with that in mind, “difficult” and somewhat disruptive win going away! A major advantage of the elevated highway/innovated approach, which would travel over the Brooklyn Bridge eastbound ramp, is that it offers long term benefits – direct access to the bridges from the BQE and the elimination of the need for northbound trucks to exit onto Atlantic avenue. Did the BHA berm plan address this? Was their proposed berm plan include upon that part of the elevated model? Please give a detailed explanation of how you think the highway can be routed “through the park” and the sequence of construction. Repair the BQE lane by lane, build a lower level above Furnan and then demolish the existing lower level, to even out the spacing, and then support the outside with decorative beams, stoa-like, so that the darned thing will never fall down. Scrap cantilevering.